PICO RIVERA — Deputies jailed two women women Sunday on suspicion of scuffling with security while shoplifting, then leading sheriff’s deputies on a short chase. Martha Almenar, 51, and Lisette Ochoa, 19, were booked on suspicion of robbery and evading police, Los Angeles County sheriff’s Lt. Jerry Cummings said. Their cities of residency were not available. Employees of a pharmacy at Whittier Boulevard and Durfee Avenue flagged down a deputy about 6:30 p.m. to report to women had just struggled with a security guard after being caught trying to shoplift and fled in a car, the lieutenant said. Deputies quickly caught up with the car and tried to pull it over, beginning a brief chase, Cummings said. The car circled through the area before heading down a dead end street near Olympic Blvd. and Citrus Drive, he said. The car then came to a stop, and the women surrendered without further incident. COVINA — Authorities Sunday released the name of a 19-year-old La Puente man who was fatally stabbed during a fight at a house party in an unincorporated county area near Covina. Christian Smith died at Los Angeles County-USC Medical Center about an hour and a half after the 2 a.m. stabbing in the 20000 block of Stephanie Drive, Los Angeles County Department of Coroner Lt. Cheryl MacWillie said. He was attending a party with about two-dozen other young adults when he became involved in a fight with another young man, sheriff’s officials said. After stabbing Smith, the assailant ran from the scene, officials added. No arrests were announced Sunday. No further information about what led up to the fatal fight was released. COVINA — A young man died early Saturday after an argument at a house party escalated into a stabbing in an unincorporated county area near Covina, authorities said. Coroner’s officials did not release the man’s identity pending notification of his family. He was initially described as being 19 years old. “Approximately 20 to 25 young adults were attending a party in the 20000 block of Stephanie Drive when, at approximately 2:00 a.m., two men began arguing,” Los Angeles County sheriff’s Sgt. Diane Hecht said in a written statement. “The argument escalated into a fight and the victim was stabbed in the upper torso,” she said. Officials took the wounded young man to a hospital where he was pronounced dead. The assailant ran from the scene and had not been found, the sergeant said. Though the suspect was described by authorities only as another young man, officials said investigators had solid leads as to his identity. The weapon used in the stabbing was not found, Hecht said. A man who answered the door at the home where the stabbing occurred did not wish to comment. Several nearby neighbors said they weren’t aware anything had happened until the sheriff’s patrol cars swarmed the street. Detectives from the Sheriff’s Homicide Bureau are handling the investigation. Anyone with information is asked to contact the bureau at 323-890-5500. LA PUENTE — Deputies arrested a suspected auto thief after he ran from deputies during a traffic stop Friday, authorities said. Alex Estrella, 30, of La Puente was booked on suspicion of auto theft and evading police, Los Angeles County sheriff’s Sgt. Victor Sotelo said. A deputy tried to pull over a reportedly stolen car about noon at Inyo Street and Ferrero Lane, Sgt. H. Macias said. The driver, later identified as Estrella, ditched the car and ran north from the deputy on Ferrero Lane, he said. Officials searched the area but did not find the suspect, Macias said. About an hour later, a resident called the sheriff’s Industry Station to report a suspicious person hiding in a backyard shed in the 600 block of Ferrero Lane, Macias said. Deputies renewed their search with the help of K-9s and soon located Estrella hiding in a nearby backyard, officials said. He was arrested without further incident. WEST COVINA — A Baldwin Park man suspected of shooting at his neighbor’s dog and threatening the 7-year-old god owner with a handgun pleaded not guilty Friday to six felony charges, court officials said. Carlton States, 31, was charged with making criminal threats, first-degree burglary with a person present, discharge of a firearm with gross negligence, and two counts of child abuse in West Covina Superior court, Los Angeles County District Attorney’s officials said in a written statement. The complaint against States also alleged personal use of a handgun in a crime. The incident occurred about 8 p.m. Wednesday in the 3700 block of Baldwin Park Boulevard, police said. While the victim was playing outside of her home with her dog, “Smalls,” the defendant allegedly began taunting the animal,” according to the district attorney’s office’s statement. “When the dog began to bark, the defendant purportedly drew a handgun, prompting the girl to run inside her home,” the statement continued. A shot was fired, but neither the girl nor the dog were struck, officials added. “Authorities allege that States then followed the child and her pet inside the home, pointed a gun at the girl — who was holding the dog in her lap — and threatened to shoot the animal,” the statement said. Bail was recommended at $270,000, court officials said, and States was due back in West Covina Superior Court June 9 for a preliminary hearing. After apparently starting their bank robbing careers with heists in San Dimas and Diamond Bar, a duo of robbers the FBI has dubbed “The Greenhorn Bandits” struck again Thursday in Redlands. The name was chosen for the bandits because of the amateur manner in which the takeover robberies have been carried out so far, FBI spokeswoman Laura Eimiller said. “They’re described as being somewhat clumsy and inexperienced by witnesses,”she said. The robbers’ apparent lack of experience and skill, “could add to the potential for violence,” she added. 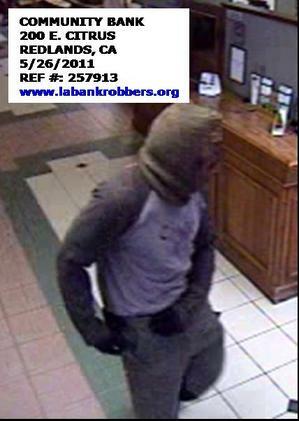 But with three bank robberies credited to them since May 16, they’re building their criminal resume fast. 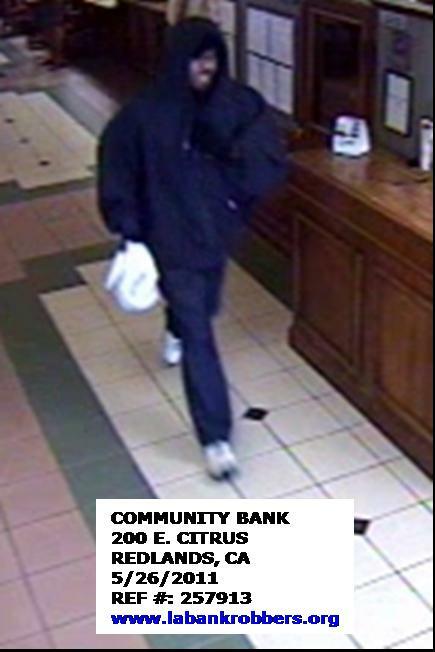 The first robbery linked to the Greenhorn Bandits took place shortly after 3 p.m. May 16 at the California Bank & Trust, 1200 S. Diamond Bar Blvd. in Diamond Bar, Los Angeles County sheriff’s Sgt. Cruz Solis said. On Monday, exactly one week later, the robbers showed up another California Bank & Trust branch at 530 W. Bonita Avenue in San Dimas just after noon, sheriff’s officials said. 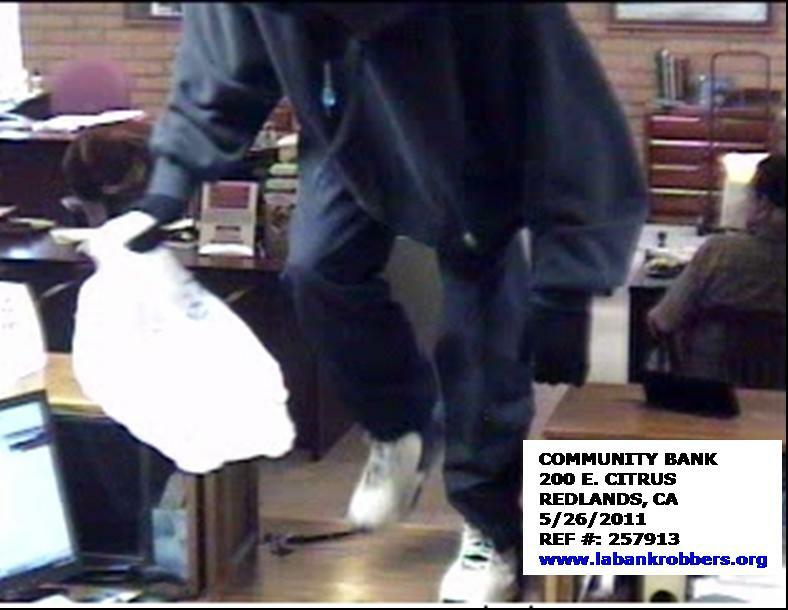 The Greenhorn Bandits robbed again just before 10:30 p.m. at a Community Bank, 200 E. Citrus Ave. in Redlands, officials said. In all three robberies, the robbers were described as Latino or black men, between 25 and 33 years old, about 5 feet 8 inches to 6 feet tall, wearing bandanas over their faces and hooded sweat shirts, Eimiller said. The men brandish a black revolver as they take over the banks and have been caught on surveillance tape carrying a white plastic grocery bag to put the stolen money in. A third suspect has been reported by witnesses acting as a getaway driver who remains in a truck parked near the banks, authorities said. In at least one of the robberies, witnesses described the truck as a silver Nissan to sheriff’s investigators. “The suspects are considered armed and dangerous,” Eimiller said. Anyone with information is asked to contact local law enforcement. ARCADIA — As part of the “AVOID 100 DUI Prevention Task Force, police are planning a checkpoint this weekend, officials said. The checkpoint will be held from 6 p.m. Saturday through 2 a.m. Sunday morning at an undisclosed location within the city, Arcadia police officials said in a written statement. Funding for Saturday’s checkpoint is being provided by the California Office of Traffic Safety, through the National Highway Traffic Safety Adminitration. ALHAMBRA — Authorities evacuated residents and blocked off streets Thursday after residents reported finding grenades — which were ultimately determined to be inert — while cleaning out their attic, police said. The incident began about 2:20 p.m. in the 2500 block of South Stranahan Drive, Alhambra police Sgt. Brandon Black said in a written statement. A resident called police after finding two of the grenades, the sergeant said. A search of the home turned up a third grenade. Police cordoned off the area, blocked traffic on nearby streets and evacuated nearby homes as the bomb squad was summoned to check out the situation, officials said. Bomb squad officials determined the grenades were harmless shortly before 4 p.m., police said, and street closures and evacuations were all lifted by 4:30 p.m. The bomb squad took the inert grenades for disposal. 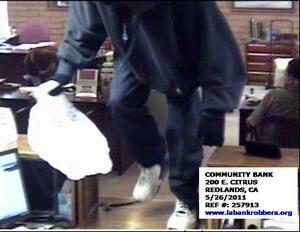 Detectives are investigating two bank robberies this month at branches of the same bank in San Dimas and Diamond Bar. The suspect descriptions and tactics bore similarities, however authorities would not say Thursday if the robberies were believed to be connected. The most recent robbery was reported just after noon Monday at the California Bank & Trust, 530 W. Bonita Avenue in San Dimas, Los Angeles County sheriff’s Sgt. Kirk Smith said. The suspects, who were initially described only as two men wearing bandanas over their faces, demanded cash before fleeing from the bank and heading west on Bonita Avenue, the sergeant said. They brandished at least one handgun. Another California Bank & Trust branch, this one at 1200 S. Diamond Bar Blvd. in Diamond Bar, was also robbed by two men just fter 3 p.m. on May 16, Sgt. Cruz Solis said. One of the robbers was a black man with a light complexion, about 6 feet tall, wearing a tan baseball cap, Solis said. The second robber was described only as about 5 feet 10 inches tall and wearing dark clothing. 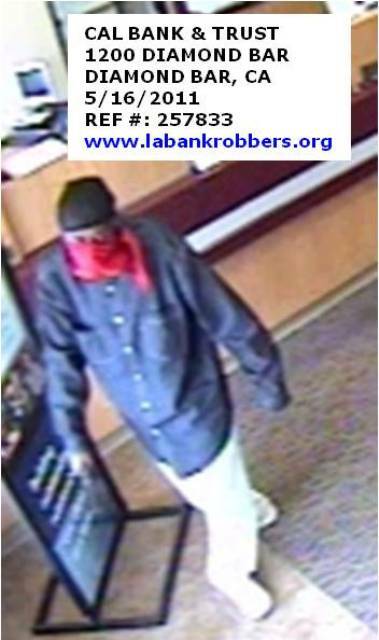 A surveillance camera image taken during the robbery and released by the FBI shows one of the robbers wearing a long-sleeve blue shirt, white pants, a black cap and a red bandana over his face. The robbers in the Diamond Bar caper were last seen fleeing south on Grand Avenue in a silver Nissan pickup truck. SANTA FE SPRINGS — A group of robbers used handguns to rob a fast-food restaurant and a family who was dining there late Wednesday, police said. The robbery took place about 8:45 p.m. at Carl’s Jr., 16105 Valley View Avenue, just south of Alondra Avenue, Whittier police officials said in a written statement. “Two suspects armed with handguns approached the front counter and demanded money from the cashier,” the statement said. The cashier complied. “A third suspect walked over to a family sitting in the dining area and demanded they hand over any valuables, while simulating a handgun through his jacket,” the statement continued. One of the family members handed the suspect their cell phone before all three suspects fled the scene in what witnesses describe as a white, late 1990’s-model, 4-door sedan, police said. The vehicle was last seen southbound on Valley View Avenue towards the 5 Freeway. Police described one robber as a Latino man of about 24 years old. He had a mustache and a shaved head, and wore a gray hooded sweat shirt. Another robber was described as a Latino man in his 20s, about 190 pounds, wearing black pants and a black jacket. The third robber was described as a Latino man in his 20s wearing a hooded sweat shirt. Anyone with information is asked to call Whittier police at 562-567-9200. Tips may be left anonymously.